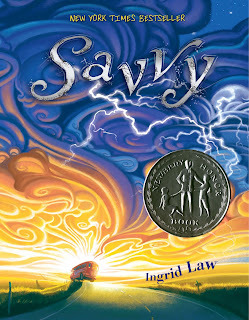 In 2009 Ingrid Law's debut middle grade novel, Savvy, won a Newbery Honor. I absolutely fell in love with the book that introduced the amazing Beaumont family and their special, supernatural abilities that surfaced exactly on one's thirteenth birthday, to the world. You can read my review here. And, as much as I loved Savvy, I am embarrassed to say that I did not read the follow up sort-of-sequel that came out in 2010, Scumble. 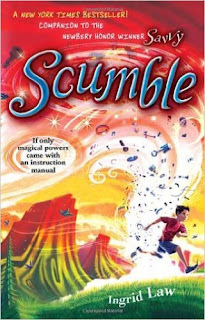 Scumble featured a cousin of the now grown-up Mibs, who narrated Savvy as an almost thirteen-year-old, and I wanted more of the Beaumonts. Happily, Switch, this new, second sequel to Savvy does feature the Beaumont family again - and some new friends. At the start of Switch, which begins ten years after Savvy ends, we meet narrator Gypsy Beaumont, a few months after her thirteenth birthday. Ten years on and the Beaumont household is a little different. The three oldest siblings have moved out. Mibs is twenty-three and engaged and Fish is married. Samson, the broody, reclusive six-year-old from Savvy now has his own savvy. Samson can turn invisible and, while he is invisible, he charges up like a battery, "giving him a storehouse of inner strength he could pass to other people with a touch." Then there is Tucker, the almost-eight-year-old baby of the family who wants to be big like everyone else so that he can have a savvy of his own. Even without her new savvy, the ability to see glimpses of people's pasts and futures, Gypsy is having some growing pains. Once a free spirited kid who loved to dance, twirl and put flowers in her hair, Gypsy has begun to question herself after her former best friend censors her. But, for the Beaumonts, an even bigger censor - or buzzkill - is headed their way. Mrs. Beaumont's father, the beloved Grandpa Bomba, has passed away and his empty room is about to be filled by the narrow minded Grandma Pat, Mr. Beaumont's mother. Mr. Beaumont is the one family member without a savvy and his mother has always disapproved of his wife and their offspring, or the "fiendish horde of rabble-rousers," as she refers to them. Grandma Pat's neighbors, the Drs Kim, have let Mr. Beaumont know that his mother is suffering from Alzheimer's and can no longer live on her own. Grandma Pat is such a mean old sourpuss that breaking the news that she'll be moving in with them seems to throw the family into a swirling savvy-storm after which everyone's savvies switch. The perfect Mrs. Beaumont is now clumsy, instead of becoming invisible, Samson now bursts into flames and instead of seeing the past and the future, Gypsy finds that she can now stop time. Most surprisingly, little Tucker now has the ability to explode in size when he's upset, like the Stay Puft Marshmallow man, only to be shrunk back with candy. 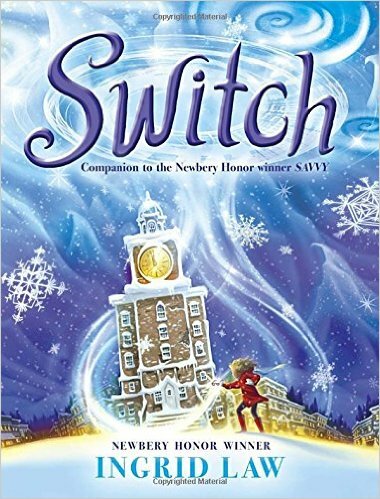 Ingrid Law is one of the few kid's book authors I can think of who writes a great road trip novel, and Switch is definitely another one of them. Mrs. Beaumont, Gypsy and Tucker hit the road, with Samson driving, to pick up Grandma Pat in Evergreen, Colorado, with Mr. Beaumont following a day behind in a moving van. Upon arrival, they discover that Grandma Pat is worse off than they realized and that the fifteen-year-old daughter of the Drs. Kim, Nola, is the only person she is pleasant to. To make things worse, Gypsy had a vision of the future before arriving in Evergreen that showed Grandma Pat in a dusty old ball gown, a tiara and snow boots perched atop the clock tower of a very old building. Gypsy saw her own hands reaching out of the building to save her, but does not know if she succeeded. From the moment they reach Evergreen, Gypsy spends every minute trying to decode the vision and keep Grandma Pat from getting to the top of that tower. Law throws a whole heap of crazy things between Grandma Pat and that clock tower on a snowy night - like two car crashes, a blizzard, a pimply bully, a fellow named Del who has the same birthday as Gypsy (and Grandma Pat) and is not affected by her time stops (allowing him to say things like, "You and I appear to have an unmoving minute on our hands,"), make-up makeovers, Volcano Laverne's Hawaiian BBQ and Waffle House, a stollen kitten, a long-ago Winter Formal and a lost love. All this plus the switched savvies of the Beaumonts and it is definitely a wild, crazy, wacky ride - and Law's charming colloquialisms, made up words like "Sardoodledom" and everything I loved about Savvy comes rushing back to me. And, as with Savvy, Switch is about family sticking by each other, even when you want to run away from someone like Grandma Patrice. Near then end of the novel Gypsy asks her Momma why she thinks their savvies got switched up. Mrs. Beaumont replies, "Maybe, sweetheart, when faced with a situation we can't change, we find extraordinary ways to change ourselves instead." This could be the tagline for the novel itself. When faced with the challenge of caring for a loved one, especially a less than friendly loved one, the Beaumonts changes themselves to meet the challenge. And that's what family does.